Weymouth and Portland Borough Council: Chris Miell is thrilled to announce that he has recently secured full planning permission for the erection of five dwellings at Wellworthy Sports and Social Club, Weymouth. 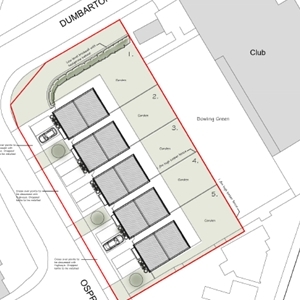 Working in collaboration with LMA Architects, we prepared, submitted and managed a comprehensive application for the proposed development, which delivers 5 x 3-bedroom detached units with associated access and parking. The land currently forms part of the outdoor bowls green for the Wellworthy Sports and Social Club and therefore it is safeguarded by Policy COM5 of the Local Plan as a ‘recreational facility’. As part of the application we demonstrated that the land was surplus to the requirements of the Club and therefore was acceptable for redevelopment. As part of the scheme, a portion of the bowls green is to be retained, albeit with less rinks, and upgraded to an all-weather surface, thus we argued that there is no need for alternative recreational uses to be provided as part of the application. Moreover, as the funds provided by the development would be used to upgrade the retained outdoor rinks, the development also provides a clear community benefit. Both arguments were accepted by the Council and the scheme was approved under delegated powers. The proposed dwellings are aimed at first timer buyers and local families. As such, the unit sizes have been designed to be reflective of the requirements of the intended purchasers and all the units are three-bedroom properties with large amenity areas. All of the units exceed the Government’s nationally described space standards (2015) and will offer a high standard of living for future occupiers. In terms of layout and design, the proposed was designed to ensure that overall quantum of development is consistent with the urban grain of the area, with the proposed dwellings being of a similar footprint to the surrounding properties, whilst retaining the area’s distinctive perimeter block structure. Externally, the proposed dwellings would be of a traditional gable roof form and be constructed from traditional materials, however, they would feature a modern fenestration design, overhanging porch and angular bay windows. Overall both our client and Wellworthy Sports and Social Club were delighted with the outcome of the application and. If you have a parcel of land and would like to pursue a residential development, then why not call Pure Town Planning on 01202 585524 or email info@puretownplanning.co.uk for a FREE 30 minute consultation on how we can help you.